Mrs Anisah Ari, WRAPA’s Senior Programme Coordinator, made the disclosure on Saturday, in Abuja. 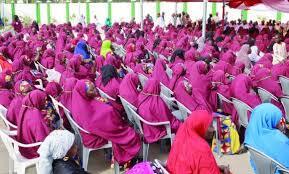 Ari said the programme tagged “Islamic Family Law’’ was designed to address certain abuses that women in the Northern part of Nigeria could be experiencing in marriage. “Islamic Family Law is a programme WRAPA designed to improve the rights of the Muslim woman in her family. “It was borne out of the need to address certain unacceptable treatments that some of these women experience in and out of marriage, ranging from divorce without any process, to lack of post divorce maintenance. “Most of these women, who were totally dependent on their husbands during marriage, are suddenly thrown into abject poverty after divorce,’’ she said. According to her, WRAPA is creating serious awareness among the men, predominantly in the North. “We work with leaders of culture and faith in these areas to try change the orientation; as well as the narrative, and create a shift in these social norms that abuse the rights of women. “From the feedback we are getting so far, we have made enormous progress. “Men in many of these communities are becoming more accommodating and the prevalence of divorce is reducing because of the processes involved,” she said. “Girls are usually forced to get married to men whom they know nothing about, sometimes the girls are not even up to the age of maturity. “We have developed tools like consent forms, where the girl has to consent to marriage before she is given out, and they have started utilising these forms,” she said. She added that the NGO was also addressing the issue of early marriage, which usually truncated the ambitions of female children. “Many of these girls have ambitions; they want to go to school but because of the society they live in, they are usually denied the opportunity. “Their ambitions and aspirations are truncated due to early marriage. “We have observed that early marriage and forced marriage are usually tied together; so we have intensified our advocacy and awareness campaign to address the anomaly,” Ari said.